I received product samples and a gift card at no cost in exchange for an honest Campbell’s Skillet Sauces review which resulted in a super yummy Quick Chicken Marsala recipe! As you can probably tell from the number of tried and true recipes I’ve posted in recent months, I really love cooking and baking. It’s actually one of my greatest passions in life that I love to share with others. Most every day I can be found in the kitchen cooking up something, often completely from scratch. Some may find me odd (it wouldn’t be the first time ;), but I really find cooking to be relaxing and a great way to show others how much you care for them straight from the heart. With that said, as much as I love cooking, I’m certainly not Susie B. Homemaker, and there are some days I want to get a good dinner on the table quickly without hitting up the fast food lane. 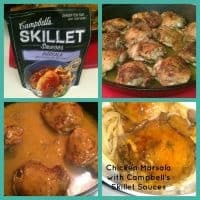 So, when I was recently given the opportunity to try out the new Campbell’s Skillet Sauces, which tout dinners ready in as little as 15 minutes, I was intrigued! Campbell’s Skillet Sauces are available in a variety of flavors including Creamy Chipotle, Scampi, Fire Roasted Tomato, Thai Green Curry, Toasted Sesame, and Marsala. I can’t remember the last time we had a Marsala dish, so that was my first pick. The idea behind the skillet sauces is that in 15 minutes you can brown up some protein and/or veggies, then stir in your sauce, let heat through for 5 minutes until your protein and/or veggies are done and dinner is ready. I can totally handle a Quick Chicken Marsala! Not being one to always stick to what I’m told, I decided to change things up a bit (aka I had a bunch of chicken thighs in the fridge that needed to be cooked). So I simply put some olive oil into my favorite cast iron pan, seasoned my chicken thighs with salt, pepper and garlic and seared on both sides. Then I placed them into a 375° oven until done – about 45 minutes. While I love the idea of pouches, which means foods usually contain less salt, I have to say I almost rather have had them be canned or at least in a carton. The pouches are fine, but you risk having a bit of the sauce explode out when you tear off the top strip to open, and then to get all the sauce out, you really have to squeeze the pouch from the bottom and roll up like you’re trying to get the last bit of toothpaste out from the tube. When I finally got all of the sauce into the skillet, I noticed it was on the rather thick side and since I was boiling pasta to go with it, I decided to add some of the juices from the cooked chicken thighs to help thin it out a bit. Once the sauce was heated up a bit, I added the chicken thighs and coated them with the sauce. We added some cooked linguine to a bowl, placed a couple chicken thighs on top and spooned over some extra sauce, added a salad and fresh bread and dinner was ready! See below for the recipe of how I put it all together. The flavor of the sauce was most excellent and the bit of chicken juices really made the dish taste homemade. We each had 2 chicken thighs over pasta as our main dish which used all of the sauce. However, I think if you used it in conjunction with a salad or veggie or 2, you could easily feed 4 people with it. Final Takeaway: We both really enjoyed the taste of the Marsala sauce and definitely be purchasing more for quick meals in the future. About the Product: Campbell’s Skillet Sauces are available at grocery stores nationwide among boxed dinner kits, marinades, sauces, gravies, etc. for approximately $2.69 per pouch. The Marsala flavor has a serving suggestion of 1/4 cup with 60 calories, 2.5g fat, 10mg cholesterol and 340 mg of sodium per serving. Ingredients include Marsala wine, portobella mushrooms, water, tomato puree, butter, modified food starch, salt, garlic, spice, citric acid and soy lecithin. Pour enough cooking oil into a skillet to lightly coat and heat over medium-high heat. Season chicken, on side with skin if applicable, with salt, pepper and garlic powder. Place chicken, skin side down if applicable, into hot skillet and sear until golden brown. In the mean time, season other side of chicken. Once first side of chicken is browned, flip and brown the other side. Once second side is brown, place skillet with chicken into oven and cook until juices run clear, about 45 minutes for chicken thighs. If using breasts, reduce heat to medium-low, remove chicken from pan and cool slightly and then cut into chunks. Place chicken back into skillet and add sauce, heating until sauce is hot and chicken is cooked through. When chicken thighs are done, remove from oven and set aside. Add Campbell's Skillet Sauce to a skillet over medium-low heat and warm. If sauce is too thick for your liking, add some of the chicken juices or chicken broth to thin out as desired. Once sauce is warm, add chicken thighs and lightly coat, cooking until both sauce and chicken are hot. Serve over freshly cooked hot pasta. Stretch the dish further by cooking some sliced mushrooms in the chicken juices after baking and serving with the sauce. Disclosure: This is a sponsored post. Campbell’s supplied me with the product so I could post about my experience. All opinions are my own. 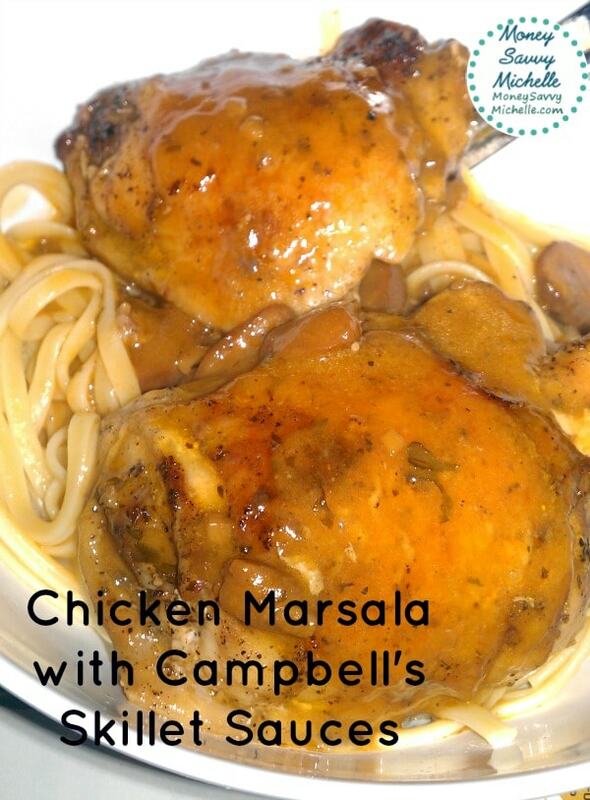 Be sure to check out our other reviews and recipes if you enjoyed this Campbell’s Skillet Sauces review and Quick Chicken Marsala recipe! We just tried this tonight and my family grudgingly ate it. It was not what I know as marsala. The first bite I took I tasted nothing but tomato, and tomato is not a traditional ingredient in marsala sauce. This is a fail for my family. I tried this recently and my family and I loved it!! I cubed the chicken served with bowtie pasta. I also added a can of sliced mushrooms. We really enjoyed it and I’m shocked some of you thought it was nasty. To each his (or her) own. We thought it was tasty and will buy again! I’m not sure why you are unable to find it at your local stores currently. I did find it on Amazon in a variety of sizes if you shop online, though: http://www.amazon.com/s/?_encoding=UTF8&camp=1789&creative=390957&field-keywords=skillet%20marsala&linkCode=ur2&tag=delossquilens-20&url=search-alias%3Daps&linkId=XPIMGQYERW5JCYHU. I just made an amazing meal just for this sauce and Ewwwwww it was so NASTY!!! Thankfully the horrid smell caught me before I ruined my whole dinner by pouring this liquid garbage on my food! I’ve never tasted Chicken Marsala that tasted like this in my entire life, the smell is putrid and the taste is so gross you’ll have nightmares about it! As soon as I smelled it I poured the sauce out of the pan, rinsed the excess sauce off the chicken breast and took a different route with the ingredients I had prepared for this. Never again will I buy this and I definitely wont be taking a chance at any of the other Campbell’s Skillet Sauces either. I felt the same exact way as this post. The smell was disgusting, and I could not serve this to my family. I cannot believe Campbells could put out something as disgusting as this. Question: can you use some of the sauce and save the rest for another day? Yes, I think as long as you refrigerated the unused sauce and used within 2 – 3 days, it should be fine. I’m not a big fan of Campbell’s soup, but this doesn’t look half bad. It’s pretty obvious you profited from this disgusting sauce… you should be a little ashamed of yourself. Hi Aaron, if you read the disclosure at the top of the post you’ll see I received products at no cost along with a gift card to buy ingredients for the recipe. I do make profit off of this site, but always give an honest opinion as stated in our disclosure policy. When we tried the sauce last year, it was actually rather tasty, but perhaps they have changed the formula since that time. Thanks for your input. It was disgusting. The smell of the sauce was making me gag. My son loves chicken marsala from Olive Garden where he works and he had gag reflexs. I thought maybe it was me and it would get better cooked with the chicken, but my son wouldn’t even eat it. He couldn’t get past the smell. I wasted 10.00 dollars on that crap. The dog woundn’t eat it. I will not even try the other one’s do to that experience. Sorry you didn’t have a positive experience with the product, Debbie. Perhaps they have changed the formula since we last tried it. Looks delicious! I didn’t know that Campbell’s made sauces. I love their soups so I’m sure their sauces are delicious as well. this is a disgusting sauce, doesn’t remotely resemble chicken marsala, which, btw, is not hard to make. Boy does that look good!